Is there anything cuter than a cat in a Santa hat? Yes, probably, but the mere sight of a cat in a holiday costume is pure crack to a crazy cat lady. Like catnip is to cats, cute is to cat lovers. 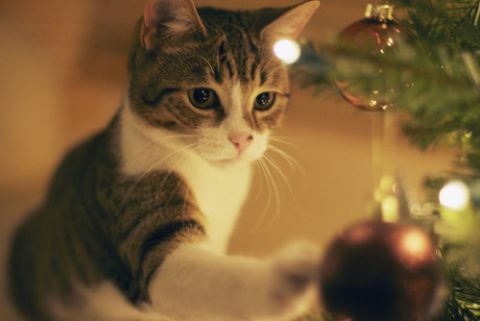 Some try to break the cute habit by switching from cats in Christmas costumes to cats in Christmas trees, but it never works. 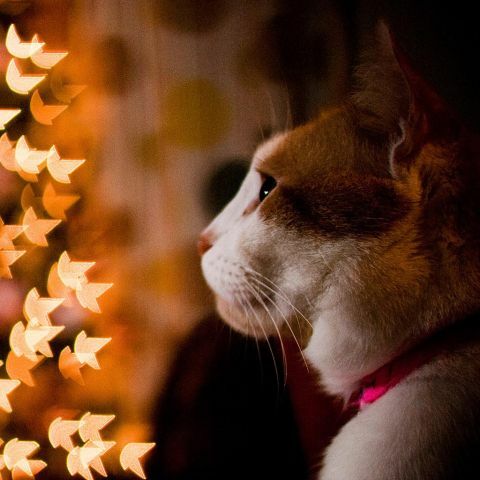 For cat ladies crazy for cute, the holidays provide an endless supply of cute. Tempting them at every turn are irresistibly cute cats, cats singing carols, jingle cats, cats with Santa, cats in snow, cats playing with Christmas wrapping paper, cat shaped cookies, cat shaped ornaments, cat shaped snowmen, Meowwy Christmas, Merry Catmess, Santa Claws, Santa Paws and Happy Howlidays swag, and the ultimate cat cute: cats in Christmas trees. Tantalized by all that holiday cat cuteness they decide to use their own cats as subjects for a fix of cute. Intoxicated by the possibility of creating their own supply of cat cute, make costumes for their unsuspecting models: Santa hats, Santa pants, Mrs. Claus dresses, Elf hats, Elf booties, Reindeer head bands, tinsel collars, anything faintly festive. When they run out of costumes, they grab any Christmas related doo-dad and begin wrapping their cats in Christmas paper, topping their heads with bows, festooning them with Christmas tree lights, sticking them in stockings. 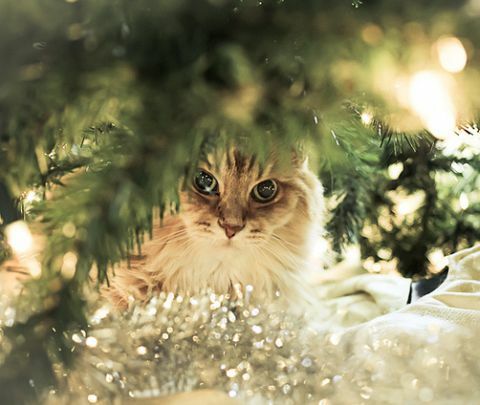 Eventually, the feline fashion victims, in hope of escaping their well-meaning but slightly crazed Christmas designer/cat Mom, climb the sparkly tree in the living room. Unfortunately, what the cats don’t realize is, they have just created the ultimate squeedorable scene: so screamingly cute that it comes with a guarantee to push even the most sensible cat lady straight over the cuteness edge. Fortunately, there is a remedy for those that are hopelessly unable to manage their cute habit. It’s pretty hard to O.D. on cute, but for those who have live by the maxim that ‘One cute cat picture is too many and a thousand are never enough’. I shudder to imagine what hitting the bottom of cute looks like.